Installing a tankless water heater - basic tips for homeowners. Find out how to install Rinnai, Noritz, Takagi, Bosch, and other on-demand water heaters; electrical, gas and plumbing tips, and recommendations. This article is for homeowners who are planning to install a tankless water heater. If you experience a problem during or after the installation or have questions regarding the unit, the best will be to call a representative for that particular brand. Installing a tankless water heater shouldn't be too complicate and hard for the handyman, as long as you follow all the codes, local and national, and manufacturer's instructions, found on the rating plate and manual. Power-vent tankless heaters, which are the most common type, are safe for installation anywhere inside your home. They are designed with sealed combustion with zero clearance to combustibles. Even with the increased safety, choosing the right location for power or direct vent models is a significant step. Tankless water heaters are different from the conventional tank-type. They heat water on demand, and since there is no storage tank, water is heated inside the heat exchanger while passing through. There is no dip tube, anode rod, not even pilot light in newer and advanced models. Tankless are small, and instead of sitting on the floor, they hang on the wall. Tankless can be installed indoors or outdoors. Indoor models utilize direct or power vent systems, while the outdoor heaters are ventless. If you live in the area with hard water, use the water softener, or you might have to do frequent flushing. Avoid rooms where chemicals, gasoline, and materials are stored as they can produce the flammable vapors. Avoid rooms that might contain an excessive amount of dirt, dust, aerosols and other debris, which can clog the air vent, reduce the fan efficiency and damage the heater. Install a tankless water heater, so it provides enough space for the future service and maintenance. A water heater designed for the outdoors should be installed only outside, in areas with the mild climates and preferable in the recess box, protected from the harsh weather. Avoid installing a tankless water heater in the attic due to safety issues. For the tankless installations at the higher elevation than designed, contact the manufacturer to confirm this application. You can install a tankless water heater in the mobile or manufactured homes, only if it is certified for this application. When installing a tankless water heater, either Noritz, Rinnai, Takagi or any other brand, see the model description on the rating plate and read the manufacturer's instruction before installation. The rating plate carries information such as the gas type, electric rating, gas and water pressure. The type of gas has to match the rating plate, and the gas pressure should be within the specified range. If the pressure is below the minimum required, the heater won't perform properly. If the pressure is higher than the maximum allowed it can cause severe problems to the heater, your property and put you in danger. Manual gas shut-off should be installed between the gas supply pipe and a heater. Once the gas connection is completed and the air is purged from the gas pipes, check for the gas leaks by using the sponge and soap-water mixture, and applying it on the fittings. Check the inlet gas pressure by using the manometer, if necessary. The gas manifold pressure is factory set, so no adjustment is usually needed. Install a tankless water heater where leakage won't damage your property. A drain pan under the heater is recommended as a way to protect the property against the water damage. All tankless water heaters mentioned here, are designed for potable water heating where the recommended supply pressure is usually between 30 and 80 PSI and water connections are 3/4". A manual shut-off valve should be installed between the cold water supply and heater. This type of the valve can also be installed on the hot water side. Install the thermal expansion tank if the water system is the closed-loop system. Do not reverse the cold inlet and hot outlet connections. Before installing a tankless water heater, flush the unit and purge all the air from water pipes. Install a pressure relief valve with the discharge pipe. Minimum water flow/pressure should be provided for the proper water heating. Hot water heater temperatures are usually factory set at 120 F.
The tankless water heaters are not suitable for installation where the chemically treated water is used, such as spas or pools. Follow the electric code requirements. The tankless water heater must be grounded. Install a remote controller if it is not provided. Most of the tankless heaters are equipped with the freeze protection system that requires electrical power. 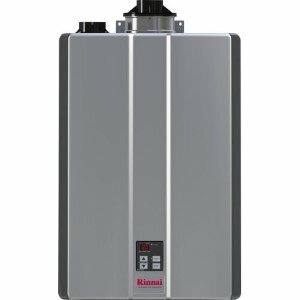 When installing a tankless water heater (the US and Canada) keep in mind to check out the electrical specs from the manufacturer's instructions: i.e., Rinnai requires 120 VAC and 60 Hz from the adequately grounded circuit. Install a water heater as close as possible to the vent area. The vent pipe must be easily removable and used only for the water heater. Avoid long runs of the vent pipe. Always consider the maximum vent length specified by the manufacturer. The vent end should never be blocked. In a case of the vertical run, through the roof, the vent has to have a rain cap. Your tankless water heater must have enough fresh air for the proper combustion and proper ventilation of the flue gases. Use the recommended material and vent size, with no changes in diameter. Maintain proper space for servicing. The vent system must be sealed airtight to prevent any leaks. The exhaust vent should never point to an opening in a building, such as windows or doors or near any air intake devices. Leave the proper clearances between the water heater and nearby objects. Turn off the water, electricity and gas supply to the old water heater. Drain and disconnect all the connections. If it is needed, install new supply lines for gas and water (either solid or flexible). Mount the tankless water heater to the wall using the existing wall studs or build a new frame using 2 x 4” lumber. If the heater came with the mounting bracket, even better, make sure the bracket is even (use the level). Once the bracket is installed on the wall using 4 screws, hang the heater on it. Screw the top and bottom bracket into the wall. Connect the shutoff valve and sediment trap to the heater and attach the gas line to it. Bleed the line. Connect the water line. Use the Teflon tape to connect. Connect the electric wire, following the manufacturer instructions as you would for gas and water. Check all the connections for leaks. Install the vent. Use the manufacturer manual for installation instructions. Use the reciprocating saw to cut out the vent hole in the drywall using the provided template. Turn the electricity, gas, and water on. Start up the water heater. Note: The licensed installer must perform installation otherwise the warranty will be voided. Open a hot water tap. There must a proper water flow (specified by the manufacturer) to activate the unit. The flow sensor detects proper flow. The computer checks the situation, and if there are no problems, it lets the igniter generate the sparks. The buzzing sound indicates that the igniter is generating sparks. The main valve opens, and the gas burner lights up. Cold water is flowing through the heat exchanger and heats up to the set temperature. Depending on the hot water demand, the gas valve will modulate - increasing or decreasing the power and the temperature. The tankless heater will shut down once the water flow drops below the deactivation point. Keep in mind that installation of a tankless water heater should be done correctly to ensure safe and reliable water heating and valid warranty. Regular maintenance which includes cleaning, visual inspection, and small service and replacement should be performed as written in the instructions.